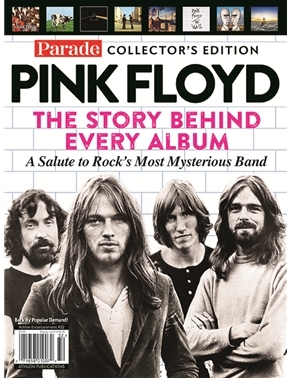 The Story Behind Every Album sheds light on PINK FLOYD, rock’s most mysterious band, with revealing and authoritative stories about the group’s hit recordings. This 98-page special goes deep into each of the group’s studio albums—from The Piper at the Gates of Dawn to Dark Side of the Moon to The Wall—to reveal the stories behind their creation. One of the best-selling and consistently revered groups in the entire classic rock pantheon, PINK FLOYD’s recording career spans six decades. From the psychedelic euphoria of the Sixties to the digitized alienation of the Twenty-Teens, the band’s story is a tale of madness, mishaps, happy accidents and memorable music. And PINK FLOYD: THE STORY BEHIND EVERY ALBUM will take you on a journey through the fascinating details, creative epiphanies and backroom squabbles that shaped their legendary body of work.